Quilt Sunday definitely got my engines revved for figuring out the back of my queen sized quilt. I had a vague idea of something ‘piecy’, using yellow as an accent to greys and grey blues. I drew a sketch and thought I would just be spontaneous and not calculate anything. 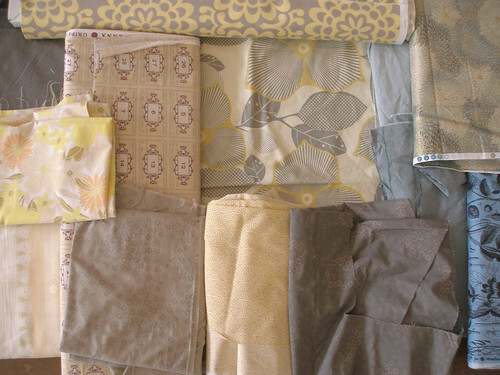 When I took out my pile of fabrics to get going, I was overwhelmed and afraid. Jacqueline has been planning her quilts on the computer and the thought of having some actual measurements to go by seemed very reassuring (and practical). I opened up Photoshop and created a file that was the size of my quilt (90″ x 108″). Then I started making boxes and shading them with the colour tones I’ve been thinking of. Once I was happy with the look, I checked to see what the final size of each box was and ‘voila’! some simple quilt math was accomplished without injury. You’ll notice that the design is very loosely based on a log cabin block. I really love the look of the log cabin and one day I hope to do a whole log cabin quilt. One day very far away from now. I’m going to try not to fret too much more about the details, the fabrics or the design and just whip it up as quickly as possible. I think there’s something to be said for being spontaneous in quilting. Though that might seem impossible when working on a project of such magnitude and time. I love the idea of a pieced back! I reckon yellow is a great choice because it will bring some energy and joy to all the greys… it will be a nice, unexpected surprise when you look at the back of the quilt. Wow great colour choices, loving yellow and grey right now, best of luck with it! Oh wow, that looks amazing. The fabrics you’ve chosen are so pretty. I love that Blythe fabric and the optic blossoms, too — it’s going to be lovely! I learned the hard way that disregarding math in the early stages can be a bad idea, especially if your quilt lines aren’t just straight lines that go in a single direction, because then you end up pressing buttons on the calculator hopelessly and have to do things like lay out lines 3 1/16th apart on one side and 3 1/28th on the other. Haha! Oh dear. Don’t fret; just dive in! I’ll be your “spotter”. Keep your quilting lines simple, and you will be just fine, I promise. And I’ll do my best to tempt you into starting a Log Cabin… They are fun to make, and a very good candidate for “production sewing”. concha – i’m working on the back now and i’m just loving the yellow bits. rebecca – it’s amazing how soothing the yellow/grey colour combination is. thanks for the wishes! johanna – can’t wait to show you this finished top. i’m halfway done, i might be needing your basting assistance soon!